June was an interesting month for us. The month started off with a meeting at our operations office here in Buffalo, NY with a number of our staff discussing the company, where we’re at and where we’re headed. The remaining 3 weeks were spent doing business as usual. We had a strong month, we ran into some issues, and we found some new cool ideas for the future. While I still have your attention, I’d like to direct your attention to this forum post — I’ll go into it a bit here, though. As the forum indicates we’re looking for feedback on our hosting and what we provide. We understand that there are some other hosts out there who provide some features we don’t, but we don’t want to be them. We want to be better, of course ;). Take 5 minutes and think about your experience with us from the minute you first visited our site to today. What did you find difficult that should be improved? What did you really like that you want to see more of? Is there something you see as obvious that we’re not doing? Let us hear it! June was a busy month for us on the maintenance side of things. A lot of it was the result of our upsteam performing a number of network upgrades to increase capacity and transit. That’s good for you though, as this means they’re routing / peering capabilities are increasing and as a result your latency will be reduced, your visitors will route better to your site, and everyone ends up happier! Our speculation is that these upgrades are both to increase network capacity due to growth (mergers, customers, etc) but also to facilitate the eventual launch of their Amsterdam and Singapore datacenters, both scheduled to be live by Q4 2011. We experienced a DDoS (If you’re not sure what this is, click here to view the Wikipedia article) targeted at our shared nameservers. Fortunately our systems administrators and engineers were able to filter the attack after a lot of hard work and interfacing with our upstream provider. Prior to this event, our uptime for these nameservers was nearly 100%. That uptime is over the course of 6 years, as those nameservers went live in 2005. Due do the redundant setup and geographically diverse layout, even scheduled maintenance would not have brought these services down in that time frame. Admittedly, this did cause downtime and we realize a number of users were severely effected by this. Like any service impacting situation, the first question we ask ourselves after the issue is resolved is “What can we do to prevent this from happening again?”. That question, specifically on the topic of this attack, has been a recurring theme in discussions with our senior administrators and management. Discussions are still active for a permanent, long term solution to ensure we do not experience the same issue again. Once the solution as been put into place, we’ll provide some information in a blog post / announcement about the nature of what happened, how we resolved the issue, and what we’ve done as a mitigation strategy. No company is immune to downtime and we recognize that, but at the same time it is critical we learn and adapt from experiences like this. After all, that kind of downtime is pretty painful for us as well. Summer is finally in full swing here, so we’re all doing our best to take advantage of the nice weather while it lasts. Those of you familiar with the North Eastern region of the United States know that 6 months out of the year, we have this terrible habit of attracting snow, severe weather, and bitter cold. A number of our employees enjoy exercising, so we’ll go running during the day outside, take bikerides, go for walks, or any other type of activity on our “lunch break”. 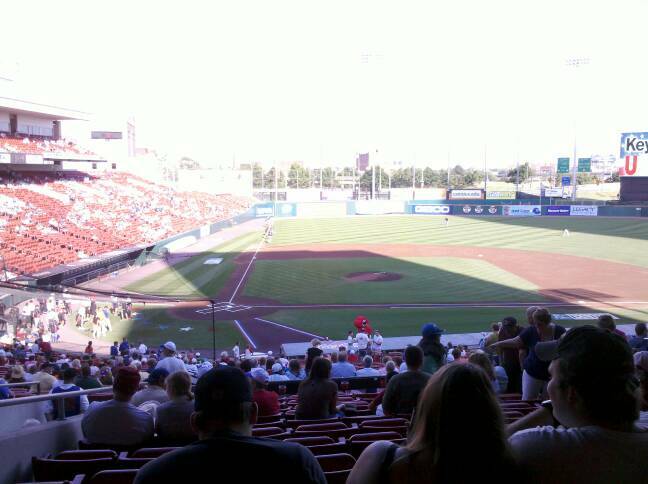 One such activity involved an outing at a local AAA baseball game for the Buffalo Bisons. Even though they ended up losing, we all had a good time anyway. Little did these people know the backs of their heads would be posted on a blog read by people across the world. Lucky them! This month brought another staff birthday, this time our CTO Cody was the reason to celebrate. While there were no office parties he did still walk away with a sweet pair of headphones which have only helped him pretend to not hear us when we need something. Our development team has also made some great progress on our VPS panel and, from what I’m told, we’ll be posting an official announcement about that sometime in the next month with some product information / releases.